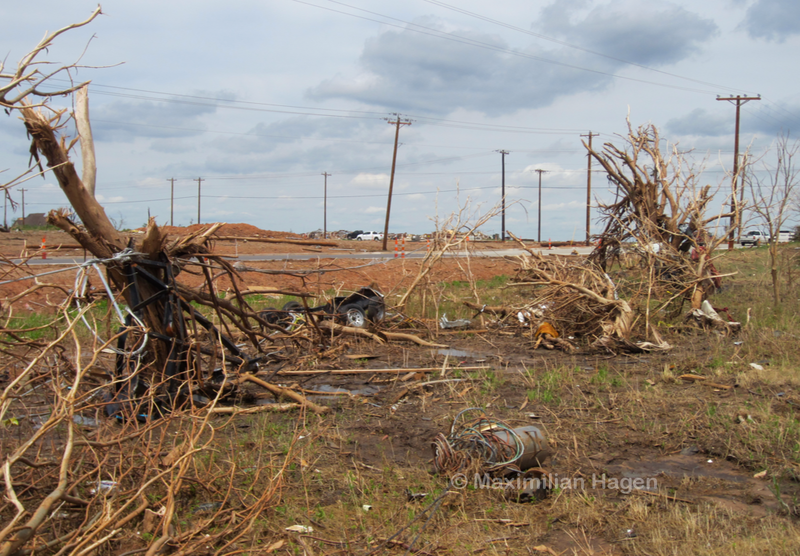 The Moore tornado left extreme damage indicators throughout its path consistent with EF5 intensity. □ On May 20, 2013, a large funnel touched down in Grady County, Oklahoma. Similar in many ways to the devastating Bridge Creek tornado of 1999, the storm travelled at a fairly slow pace and was tracked by weather helicopters as it roared towards the southern suburbs of Oklahoma City. The tornado rapidly strengthened as it crossed Drexel Avenue and likely reached EF5 intensity three miles west of Moore. A pronounced streak of ground scouring marked the tornado’s inner core as it travelled almost due east through a low density residential area with dozens of large, well-constructed homes. A three-story mansion on South Mays Avenue was nearly leveled by the tornado despite being spared the storm’s most intense winds. Residences impacted directly by the tornado were swept completely away and adjacent trees were stripped of all bark and branches. 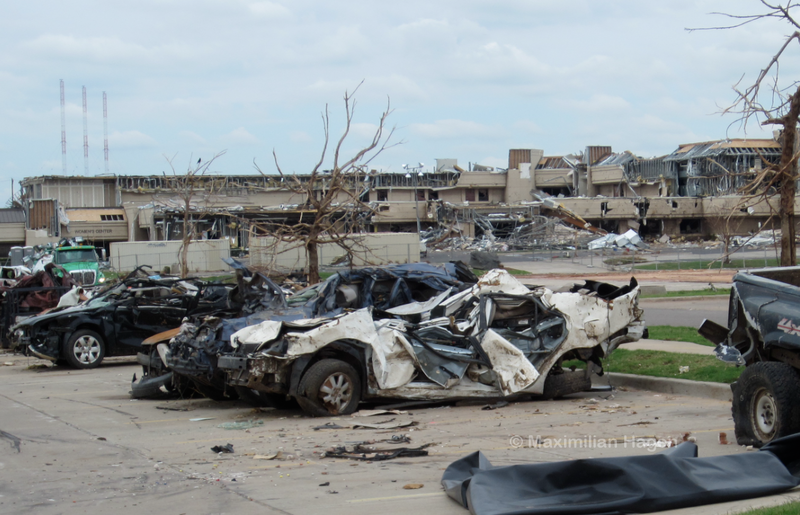 Vehicles from destroyed homes were thrown over a quarter mile and mangled beyond recognition. After crossing Western Avenue, the core of the storm travelled parallel to a residential subdivision before slamming into Briarwood Elementary School at EF5 intensity. 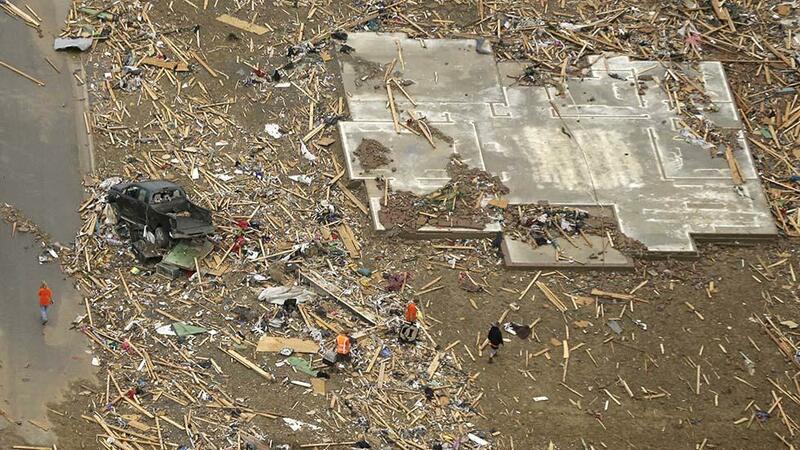 After destroying the school, the tornado entered a densely populated section of Moore at high-end EF4 intensity. 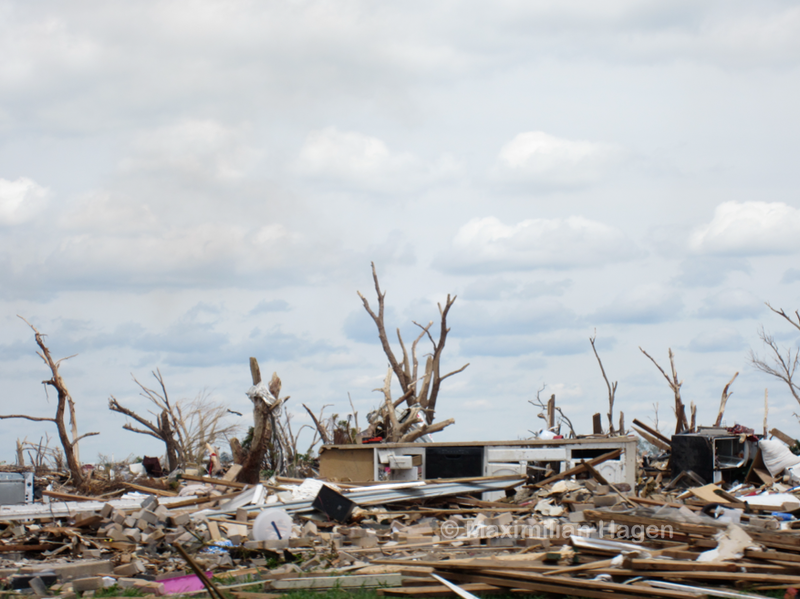 Every home within a 150 yard wide swath was completely leveled as the storm made a turn to the northeast. Damage patterns indicate that the tornado briefly reached EF5 strength a second time as it crossed over Plaza Towers Elementary and adjacent homes. More than half of the fatalities occurred in this area. The tornado continued curving to the northeast before reaching Telephone Road, at which point the storm made a turn to the east-southeast. The northernmost building affected by EF4 winds was a 7-Eleven convenient store where four people sheltering in a walk-in freezer were killed. 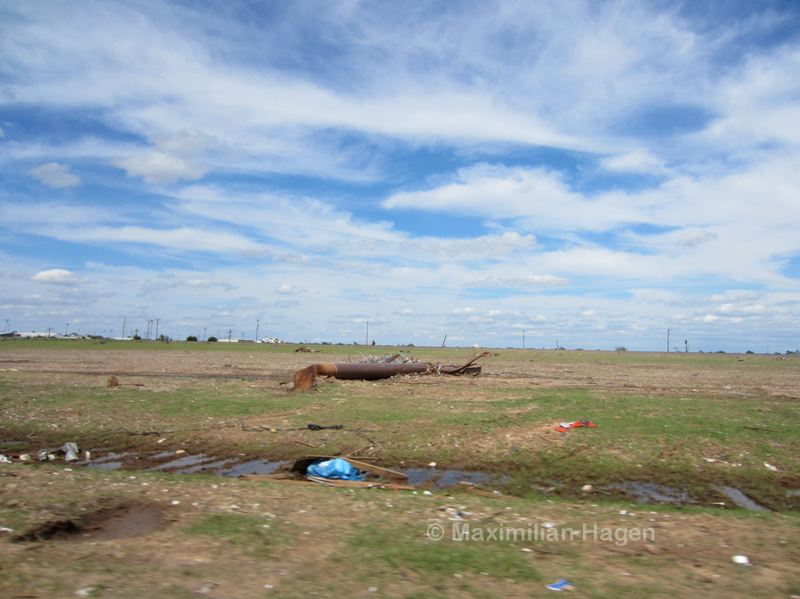 After crossing the I-35, the tornado abruptly narrowed but continued leaving a streak of EF4 damage. The tornado’s final fatality occurred just west of Highland East Junior High School. In total, the tornado destroyed more than 1,500 homes and caused nearly 2 billion dollars in damage. I surveyed the damage in Moore in the last week of May. My final analysis can be found at bottom. A tree line just west of Pennsylvania Avenue was stripped bare. The tornado likely reached EF5 intensity less than a minute before striking this area. Five of the storm’s fatalities occurred in large homes swept completely away between Drexel Avenue and SW 155th Street. A brick home on Pennsylvania Avenue was swept completely away. The home’s residents, like most people in the area, survived the storm in an underground storm shelter. 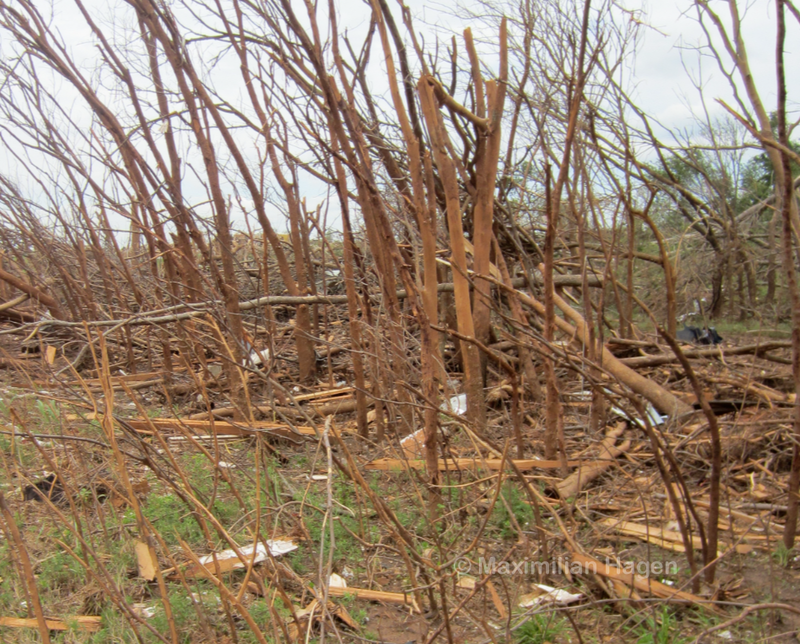 A once heavily forested area just east of SW 155th Street was obliterated by winds of EF5 intensity. Even small shrubs were stripped completely of bark and leaves. Heavy debris was thrown several miles and found wrapped around the few remaining trees. Pieces of destroyed vehicles, including a car seat and a steering wheel, where left strewn amidst destroyed trees. The narrow core of peak winds spared a large, well-built brick home on SW 149th Street but passed directly over a forested area to the south. The few standing trees were stripped of all bark and branches. 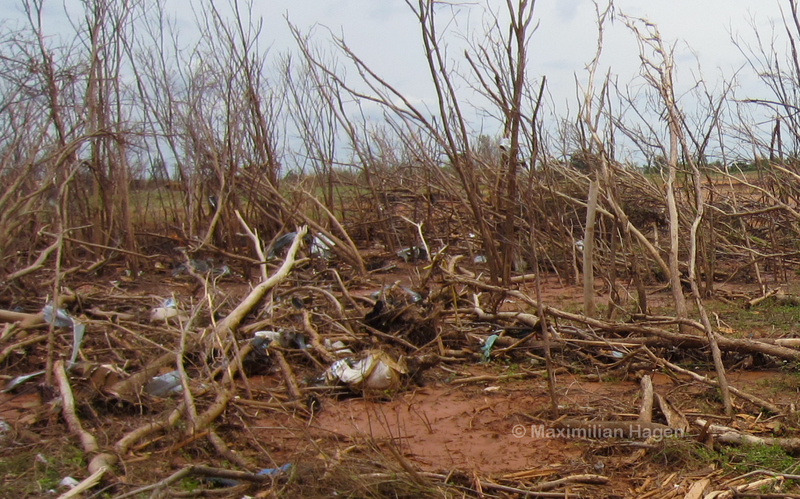 Vegetation in the immediate foreground and on the other side of the pond were outside the EF5 damage zone. Grass scouring on an uphill slope near a cul-de-sac under construction. While heavy rainfall affected Oklahoma City in the weeks following the storm, all of the vegetation in this area was bent in the direction of the storm’s movement. 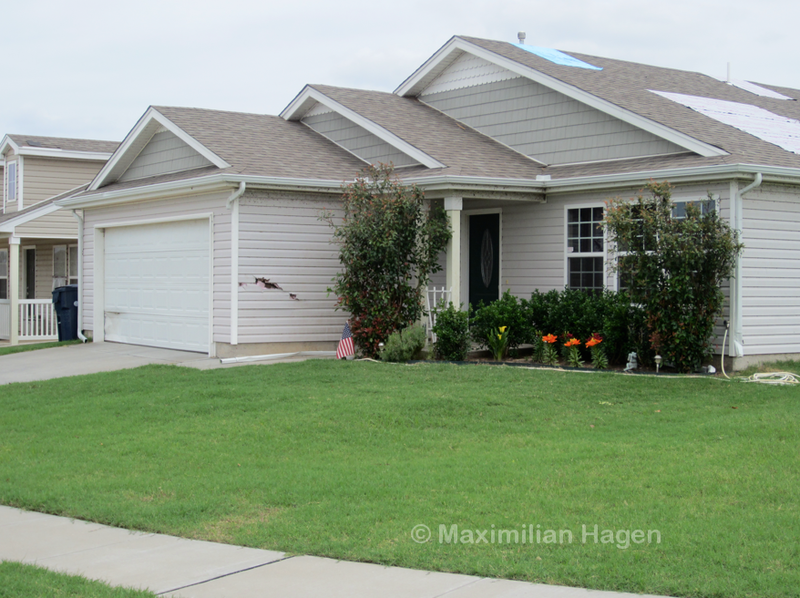 Homes on Nightshade Drive lay just outside the worst devastation. Some buildings were impaled by high velocity debris thrown from the funnel. Extreme vegetation damage and ground scouring occurred at the southwest corner of 149th and Western Avenue. A black truck was thrown from one of the residential neighborhoods far to the west and ripped into several pieces. Part of the frame along with the two rear tires is visible at center. The EF5 damage streak was less than 40 yards in width. Powerlines visible in the background were installed after the storm. A tree line was obliterated just west of Briarwood Elementary. 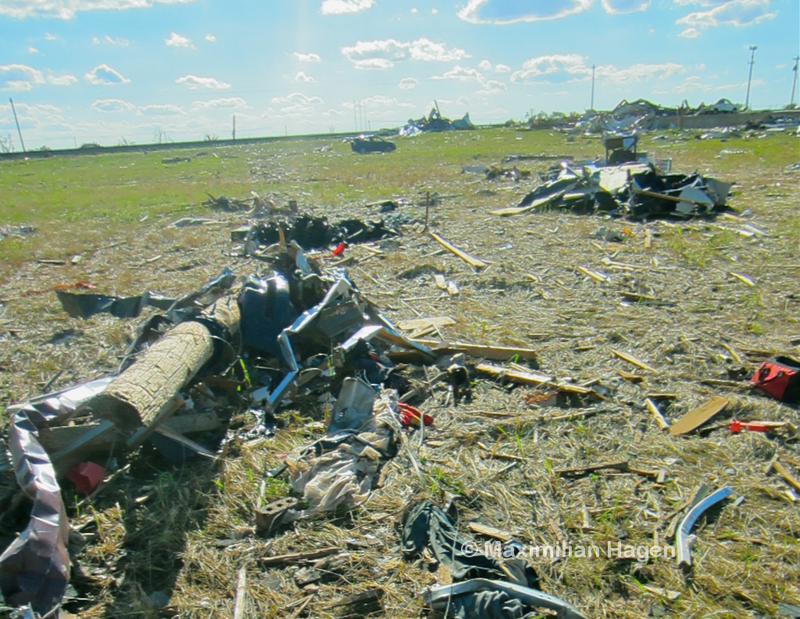 Debris from obliterated homes was ground into small pieces, a sign of extreme intensity. The damage contour was sharp, particularly on the southern edge of the tornado’s path. 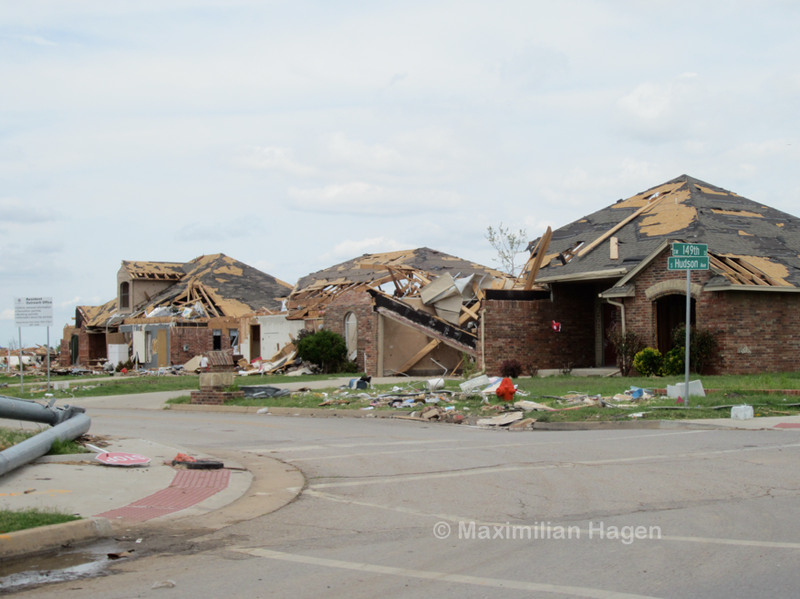 The homes visible in this picture were immediately adjacent to the EF5 damage streak. A neighborhood near Santa Fe Avenue was flattened and partially swept away. Two fatalities occurred in this area. A huge, crumpled metal object was left in a backyard on Santa Fe Avenue. Surveyors later determined that it was a water tank that had been hurled 1.3 miles from Western Avenue (Ortega, Burgess et al., 2014). High velocity debris was left imbedded in the ground in a drainage basin adjacent to Santa Fe Avenue. Upon closer inspection, most of the boards had penetrated between 6″ and 18″ into the ground. 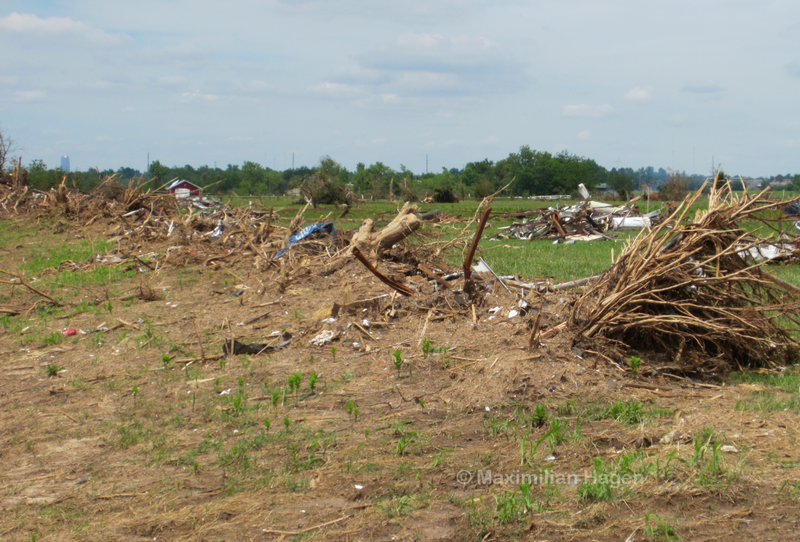 A damage survey concluded that several homes on SW 147th Street (two blocks beyond the grass field) were obliterated in EF5 fashion (Ortega, Burgess et al., 2014). 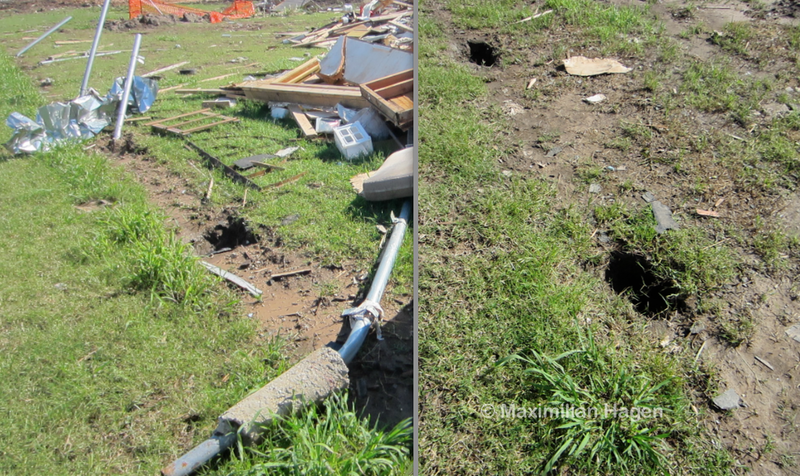 Metal fence posts anchored 18″ deep in concrete were a common site throughout the damage zones. Fence posts adjacent to homes with EF3 damage were bent nearly to the ground, whereas others were removed entirely in the worst affected areas. A cargo container was thrown more than a quarter of a mile (according to a local resident) and left in the debris of a leveled home. In the foreground, the remains of a brick home located a block southwest of Plaza Towers Elementary. The remains of large, two-story homes of solid construction near Plaza Towers Elementary. I was unable to access the most intense damage on SW 14th Street due to numerous police checks and road blocks. Heavy damage at Moore Medical Center. Small trees in the parking lot were stripped completely of bark and branches. A damage survey concluded that a row of homes just west of the complex experienced EF5 damage (Ortega, Burgess et al., 2014). Due to extensive warning, no fatalities occurred in the medical center. Extreme damage in the vicinity of the medical center. 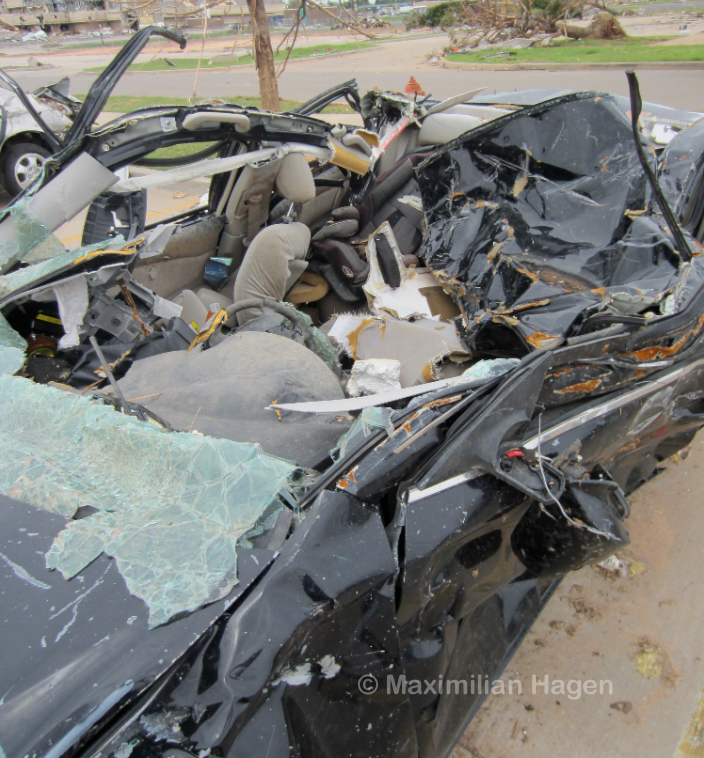 Hundreds of vehicles were mangled beyond recognition in the tornado’s path. 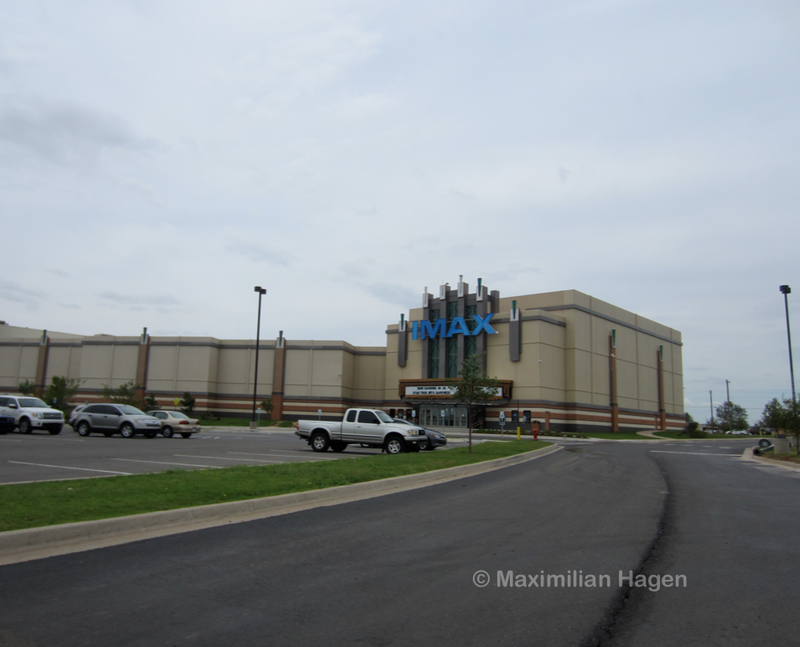 A large theater complex experienced minor damage as the tornado made a brief jog to the north. 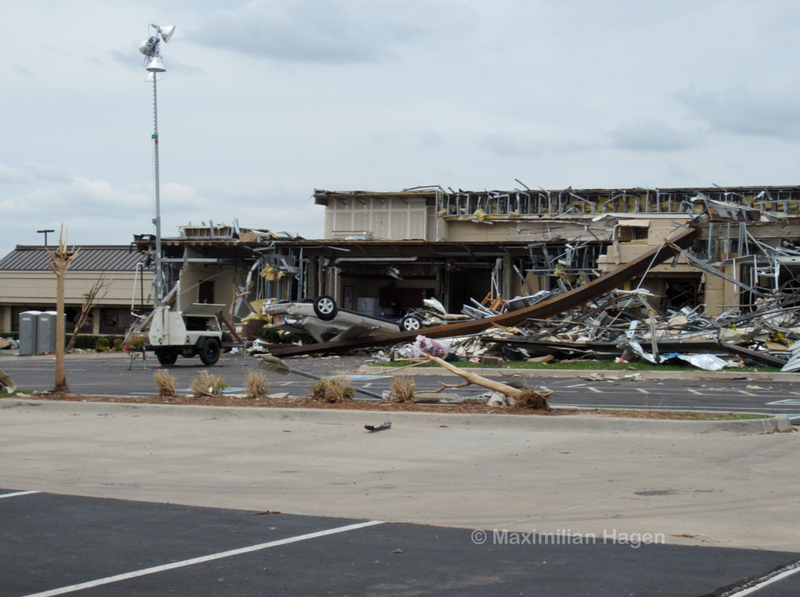 Buildings on three sides of the theater complex experienced EF3+ damage yet none of the small trees in the theater’s parking lot were uprooted. Just west of the freeway, a large bowling alley was leveled to the ground. The steel cross-beams overlying the structure were broken and denuded. In the building’s parking lot, signs were bent to the ground in a southerly direction. Some of the signs were twisted due to the opposing forces in the front and backside of the storm. Large pieces of concrete were chipped from curbsides due to impacts from heavy debris. The tornado abruptly narrowed after crossing the I-35 and turned to the east-southeast. The metal stand of a billboard was bent and broken just above ground level. A trail of partial grass scouring and wind rowing only 15 yards wide was left in a field by Tower Drive. A powerline from Broadway Street (marked by an identification code) was lofted a quarter mile and wrapped in sheet metal. 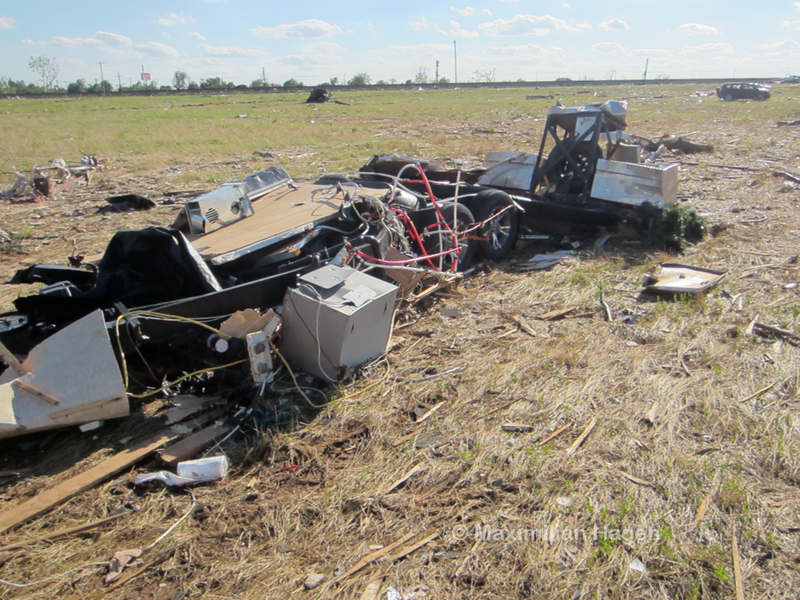 An office trailer was thrown from an unknown location and completely destroyed. Frail sheds only a few yards away from the damage core were left standing. 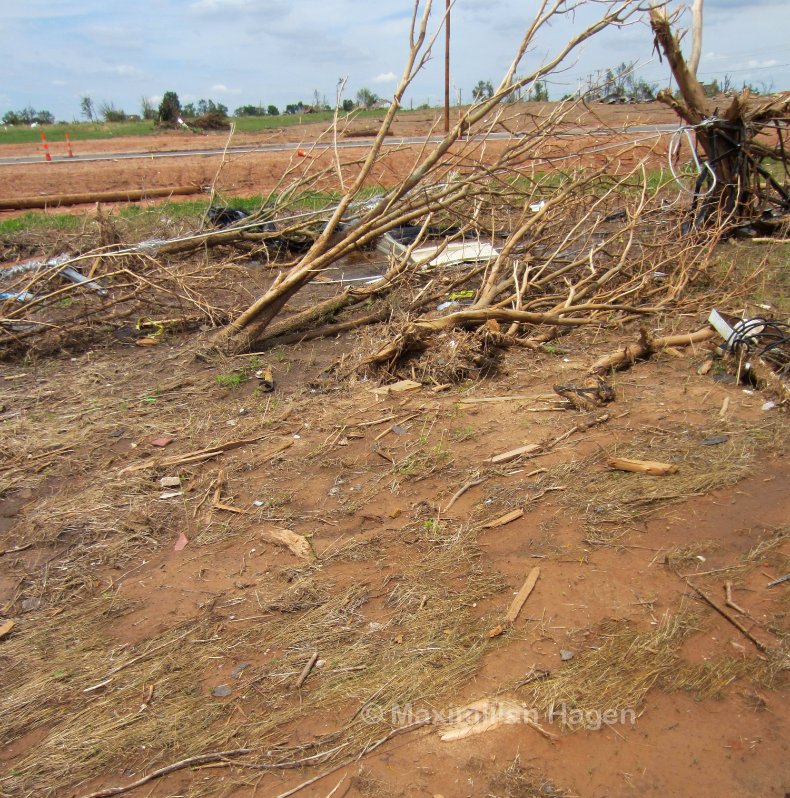 The tornado’s damage contour became extremely sharp in eastern Moore. Homes on the south side of Madison Place Drive suffered superficial damage whereas homes on the other side of the street were leveled. A light pole was nearly pulled from its anchorage and thick brick pillars were ripped from the ground. Personal Damage Survey Conclusions: Due to my belief that the Enhanced Fujita Scale grossly underestimates winds in violent tornadoes, the wind ranges I utilize are based on my research, discussions with wind engineers and comparisons between known surface readings and adjacent damage indicators in past tornadoes. My wind estimates are significantly higher than those employed by the National Weather Service. □ The Moore tornado likely reached EF5 intensity just east of Drexel Avenue and largely maintained this intensity up until it impacted Briarwood Elementary. The worst damage was confined within a 30-yard wide streak that was made visible by ground scouring and extreme vegetation damage. 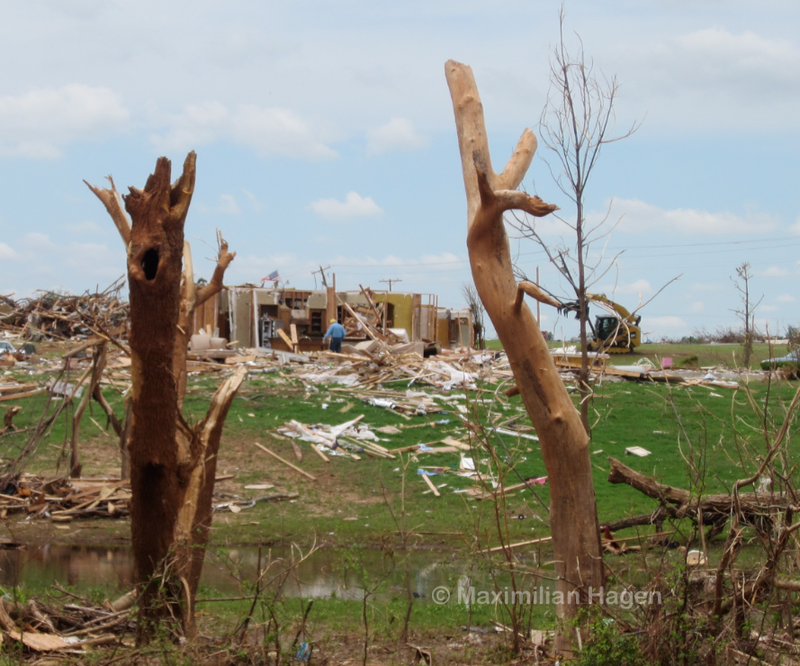 The largest trees impacted by the storm were stripped completely of bark and branches in a manner congruent with the most intense documented tornadoes. Vehicles were pulverized and large cargo containers and other objects weighing well over 10,000lbs were hurled more than a mile. 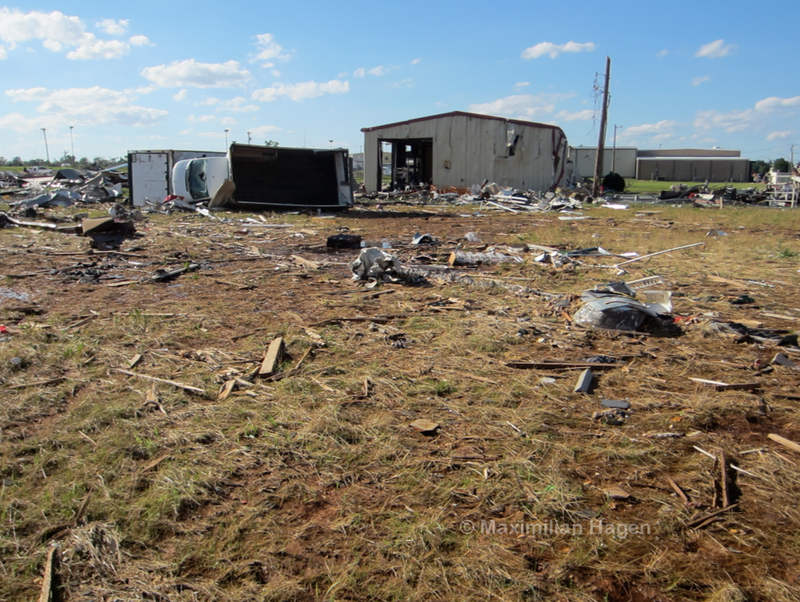 Well-constructed two-story homes were swept completely away in areas just west of Moore. 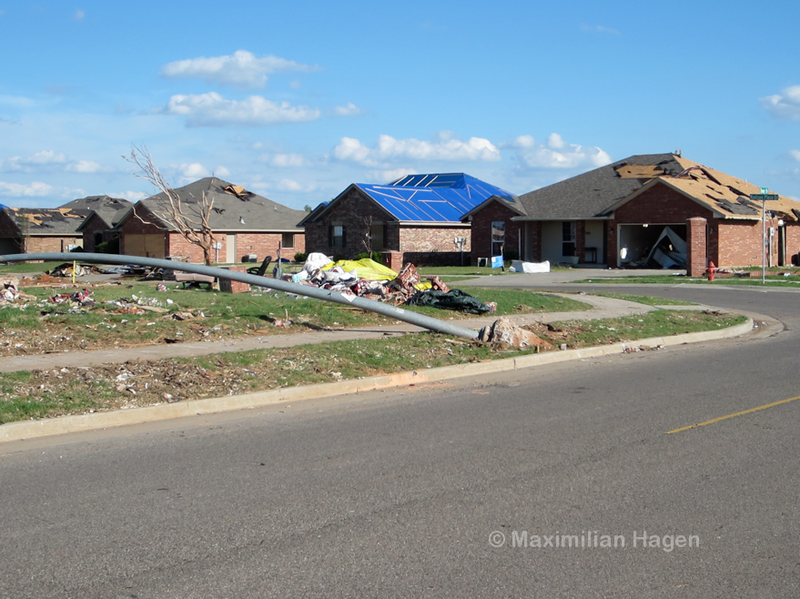 A secondary intensity maxima may have occurred from Plaza Towers Elementary to just west of the Moore Medical Center, where several entire streets of homes was reduced to concrete slabs. Pronounced wind rowing was visible in aerial photographs and grass was ripped from the ground. Metal fence posts with light concrete anchorage were bent to the ground or completely uprooted by a mixture of debris impacts and extreme winds. The sharp contour between EF5 damage and EF1 damage is visible in this image from SW 149th Street. The vegetation scouring and tree debarking alone done in this tornado IMO put the vegetation scouring and tree debarking done in the El Reno tornado to shame. Amazing pictures Max. The shredding of vegetation is there some of the worst iv’e seen. Also, aerial photography shows that a cluster if four brick homes were swept away on W 6th street, right behind Moore Medical Center, accompanied by an intense spot of ground scouring. I was wondering if you got to check that area out. Part of me thinks that a third brief burst of EF5 may have occurred there. Also, are you positive that those large homes east of Moore were swept clean by the tornado, and not cleanup? I can’t seem to find any clean house slabs in that area on the crisis map. Buckeye – these photos were taken more than a week after the storm so there was definitely some clean up, particularly of the homes in the “wealthy” subdivision west of Moore where five deaths occurred (hence the reason I only used a few pictures from that area because some homes had clearly been bulldozed). I just took another look at the crisis map and you’re right about the home in the first picture, it must have been bulldozed after the storm. The second brick home, however, was reduced to its foundation by the storm (the one at 15262 S Pennsylvania Avenue). I spoke with a resident of the area who told me there were no deaths in that immediate area because everyone was hiding in a storm shelter. I did get a look at the 7-Eleven and the damage was very high end in the field to the south, possibly approaching EF5 intensity. It was almost as if a tendril from the tornado reached out and completely obliterated that store yet left the areas to the west, north and east comparatively unscathed. Do you know how long it was at its peak intensity for and what damage gave you the estimation of 260+mph besides the ground scouring and shredded vegetation? Excellent evaluation by the way! The tornado was at EF5 intensity for about five minutes, though it was borderline EF5 most of the time. I picked the 260mph+ wind estimate primarily on the vegetation damage and scouring, but also the complete destruction of large homes with tightly spaced anchor bolts on South May Avenue and SW 155th Street as well the condition of some of the vehicles. I, personally, believe that true EF5 damage happens when the winds near the surface are over 250mph. Particularly when the narrowness of the primary damage streak indicates peak winds lasted less than five seconds. This seems closer to the F5 minimum on the original Fujita scale. 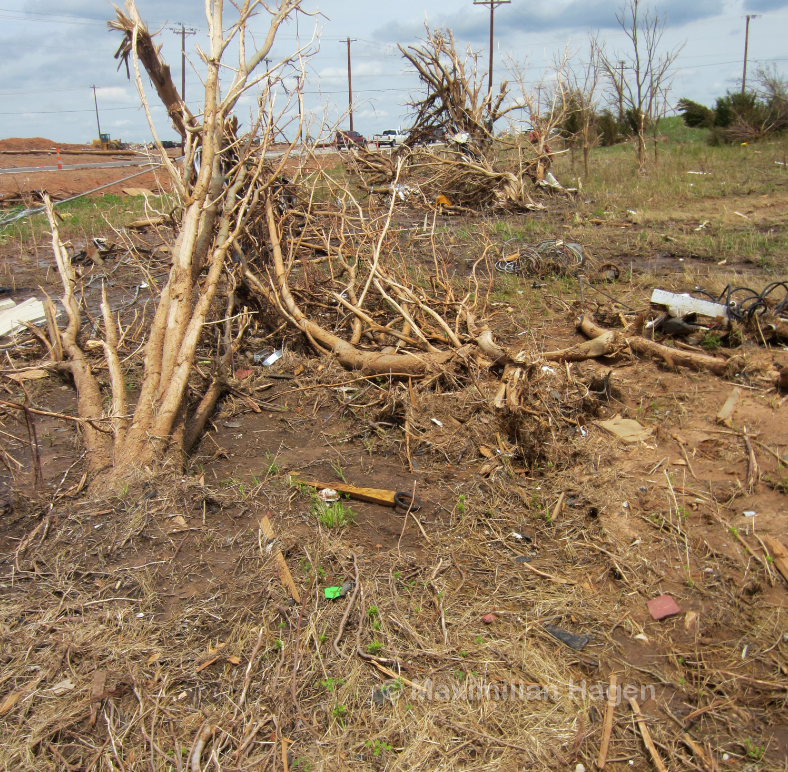 What was the evidence used to so drastically reduce the wind estimates for EF3+ tornadoes? How would this tornado compare to the 2011 tornadoes like Tuscaloosa, Smithville, Rainsville and Phil Campbell, if you don’t mind me asking another question. The wind speed estimates were reduced due to equations utilized by engineers which indicate that cyclonic winds of 200mph for three to five seconds are capable of leveling most buildings. These estimates also rely heavily on the belief that debris impacts are a major cause of extreme damage. Nearly every single wind estimate is calibrated by finding the minimum possible wind speed capable of causing a certain level of damage. Comparing this tornado to the 2011 events is hard because they all moved so fast. The Moore tornado was incredible, but not quite as violent as Smithville or Phil Campbell. I can imagine, though, that the rapid forward motion of the April 17 EF5s would have added perhaps ~30 mph to the maximum winds compared with the Moore tornado. Found video of a field near Moore Medical Center that was reduced to bare soil and clumps of dirt. Impressive, though I personally think that this may have been a result of copious amounts of flying debris and tumbling cars. Also of note is the removal of a manhole cover visible at 2:56. Only other instances I know of this occurring would be Joplin and Tuscaloosa. Awesome video. I don’t believe debris impacts were the major factor (or else the grass in Joplin etc… would have been stripped everywhere, which was not the case at all) but probably a combination of intensity (the tornado was probably at borderline EF5 intensity in a narrow strip from Plaza Towers to the MMC) and heavy rainfall, which left some low lying flooding in areas affected by the tornado. The intensity of the damage to the vehicles is incredible. I’m about to add the Moore tornado to my “strongest” list and am still trying to find the most “objective” place to put it. Probably below Rainsville and above Guin. I know that peak winds in a tornado generally last only for a few seconds but do you know how often tornadoes can reach peak winds and fluctuate and go back to peak winds during their life span? Would something like an EF5 only reach peak winds for a few seconds and return to EF3+ winds for the rest of the life span or would it reach peak winds at least several different times during its path? I’d like to see what extremeplanet says, but I think it has to do with the suction vortices. The winds are strongest where a suction vortex within the tornado moves around to the right side of the tornado, where the winds of the main circulation, the winds of the suction vortex, and the tornado’s forward speed all line up. This lasts for a few seconds until the vortex moves out of the right side, but could be followed a few seconds later by another vortex with similar winds. I believe it was mentioned on another page of this site that the Hackleburg tornado maintained EF5 intensity continuously for 14 miles. But the zone of peak winds was so small and moving so fast that, even though it maintained peak intensity, no single location was exposed to it for more than a few seconds. The amount of time a tornado attains peak intensity varies tremendously – it could be very briefly (May 2013 Granbury tornado) or it could be for 30 minutes or more (Phil Campbell, ’99 Bridge Creek etc…). I bet a large portion of long tracked EF3/EF4 tornadoes reach EF5 intensity at one or more points in their life. 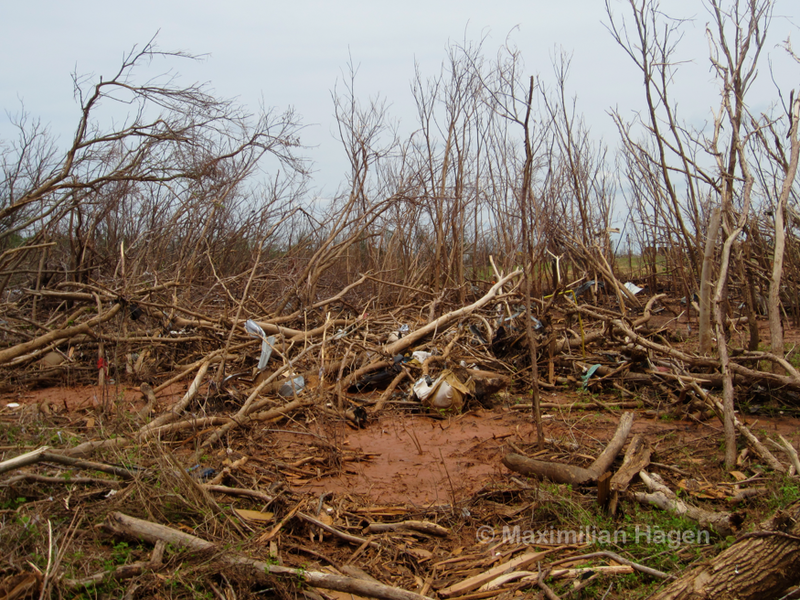 Aerial surveys of forest damage from some of the lesser known tornadoes on 4/27/11 indicate that the storms fluctuated in intensity and width in very unpredictable, fluid ways. Like Newt said, the interference from winds in the main funnel along with updrafts and transient suction vortices lead to instances where all the winds briefly align and magnify each other. 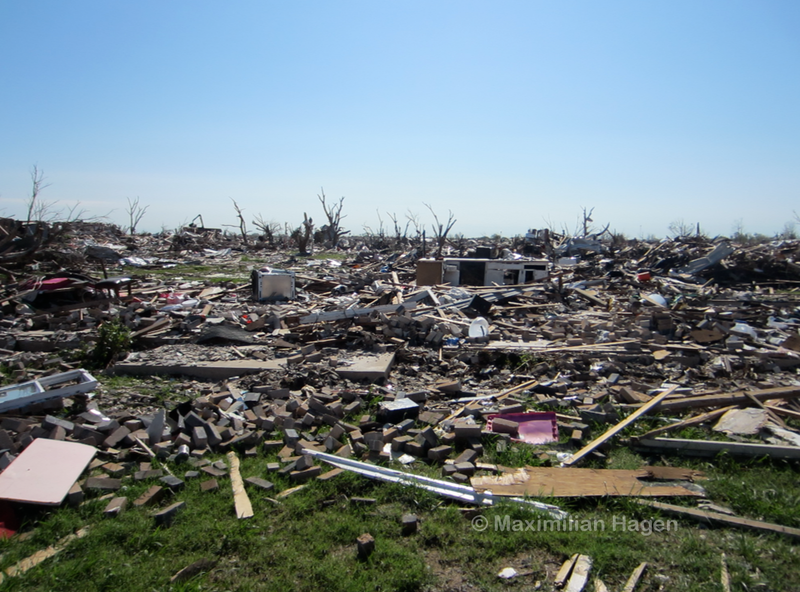 Other tornadoes, like Smithville, leave a very solid swath of EF5 damage that does not appear to be the work of suction spots but instead the right “eyewall” of the tornado’s inner core. What was the damage rating at the bowling alley that was completely leveled to the ground? I don’t know much about construction but from what I heard from newscast and reporters it seemed to be really impressive construction. Looking at I would have guessed high-end EF4. Do you happen to know what the building was made out of? I wasn’t even aware of the bowling alley until just now. I looked it up on google maps and realized I spent quite a bit of time standing in the bowling alley’s parking lot and I have quite a few pictures of it. The damage from the Moore Medical Center to an area maybe a half mile east of the freeway was definitely of EF4 intensity. The fact that there was only one death east of the 7-Eleven is due to the fact that nearly everyone had left the area or gone underground. If my memory recalls the bowling alley may have been made out of some type of steel-reinforced concrete. 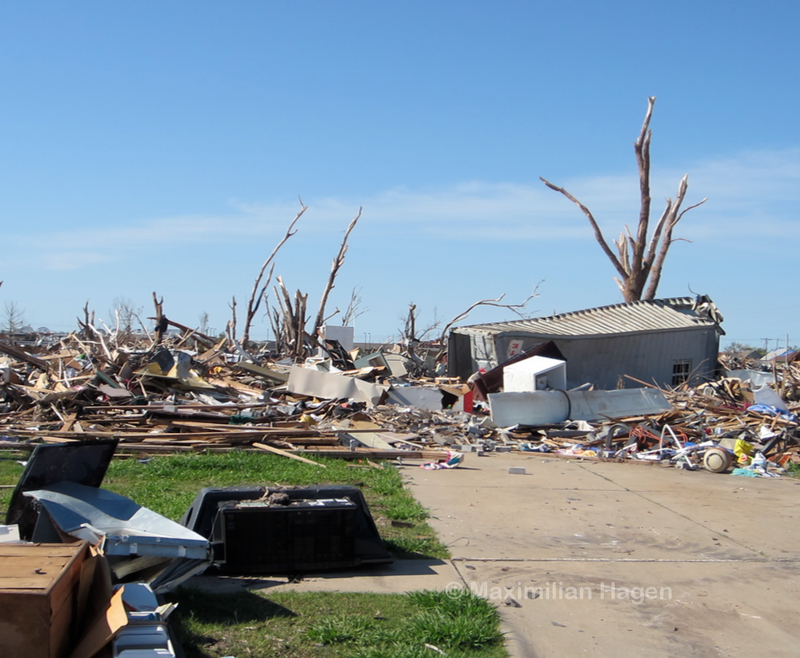 It was one of the structures I saw on TV that deemed to me this tornado was very violent. Are you going to pictures of the bowling alley on here? Just put together and added a picture of the bowling alley above. A large truck blocked my view of it so the steel-beams are only visible in a few unspectacular photographs. The handicapped signs in the parking lot were interesting – and 6″ diameter trees around the building were sheared only a few inches above the ground. 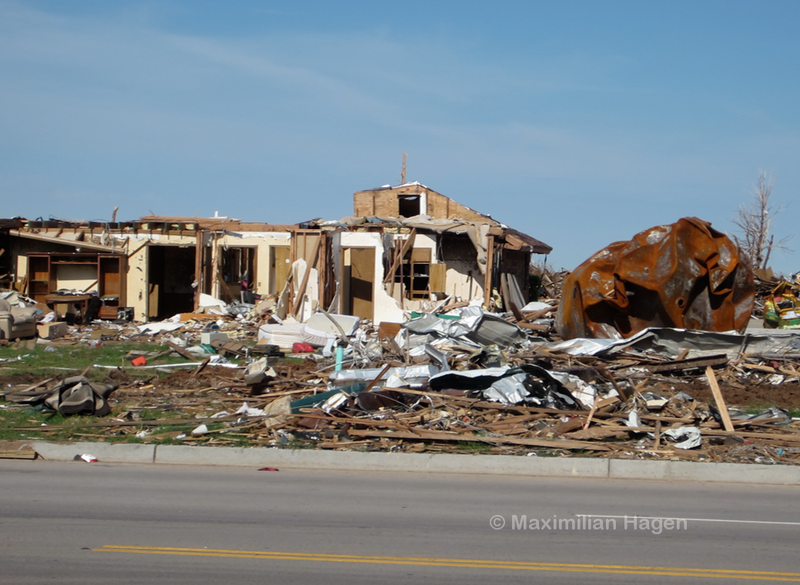 I was curious to know how damage like this factors into the surveys made on tornado damage. In this article it states how the Moore tornado of 2013 destroyed safe rooms reinforced with concrete. Not sure how much you’ve heard about that but would something like that automatically place a tornado at EF5 by a survey team? Because those shelters are supposed to be extremely sturdy. How does something like that get taken into effect for a tornado’s rating? Billy – I have heard that claim in regards to the Moore tornado but always indirectly, as it is in that article. It never explicitly states where it happened, only that the tornado was strong enough to breech reinforced safe-rooms. Until I get more evidence, I have to assume it’s just a rumor (even solid news sources report inaccurate information when it comes to tornadoes). I have no doubt an EF5 could destroy an above ground safe-room, particularly if a vehicle or large tank struck it at high speeds, and that might be solid evidence of extreme intensity. Based on the damage surveys I have seen I think the 2013 Moore storm was stronger than the 1999 tornado while it went through the city. The 1999 storm was a solid F4 with a brief last spurt or two of F5 strength but the 2013 tornado peaked as it moved through Moore and the EF-5 damage is more consistent especially near Plaza Towers. Estimating surface winds is always difficult, I would guess anywhere from 210-250+ at points. Wish the DOW had been nearby and we could have gotten a better estimate, but definately a solid EF-5 no doubt about it. 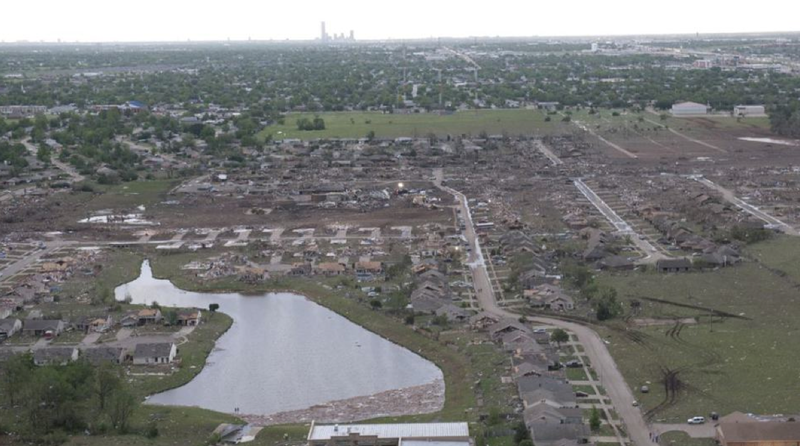 I think the 2013 tornado in Moore was also stronger than the Andover tornado of 1991 in Kansas. I’m sure someone’s already asked before but I cannot find it. What is the widest length that extreme winds could stretch out for in a tornado? In this specific one, the EF5 winds only extended for 40 yards right? Can EF5 winds extend out for over half a mile or is it always confined to less than a hundred yards? Has something close to a half mile been surveyed before? Most tornadoes only cause EF5 damage over an area no wider than 100 yards. There are some glaring exceptions to this rule, such as the ’97 Jarrell tornado, which caused a strip of extreme ground scouring and probable EF5 damage more than half a mile wide. 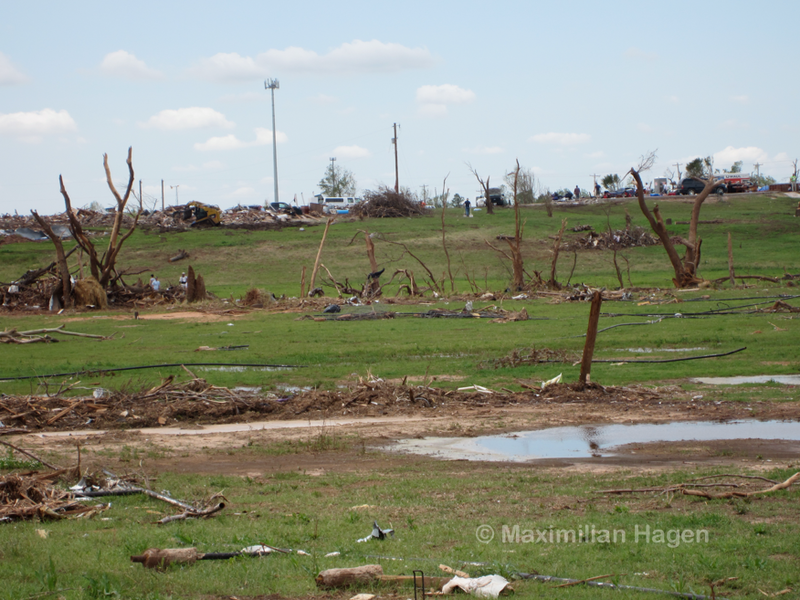 The Joplin tornado also caused high-end EF4/EF5 damage over an area up to 600 yards wide. What the case with Jarrell possibly due to its slow movement allowing the suction vortices to hit just about everything in the main path of the tornado? Yes, the slow movement of the storm was probably the reason why the extreme damage path was so wide, and the fact that the storm had widely spaced suction vortices (similar to but likely more violent/slow moving than Joplin). Very good analysis. I fully agree when you say that the NWS grossly underestimates wind speeds in tornadoes. Being that I live in Wisconsin, I like to use the 84 Barneveld Tornado as an example. There is no way that the tornado could obliterate an entire town that quickly with winds any less than about 260. Some estimates I’ve read in local newspapers put the winds at 300+ for that tornado. What are your thoughts? I discuss the Barneveld tornado in “The Indefinitive list of the strongest tornadoes….” Part IV. In short, I think the Barneveld tornado was extremely violent and powerful, as you say. I do believe the tornado probably falls on the lower end of the present-day EF5 rating. I found an article that said that a University of Oklahoma study upgraded the El Reno tornado’s size from 2.6 miles wide to 4.3 miles wide. Take a look. Interesting. I read the report and do not remember it mentioning an “upgrade” in the path width but the doppler velocities may have extended that far at a higher altitude. 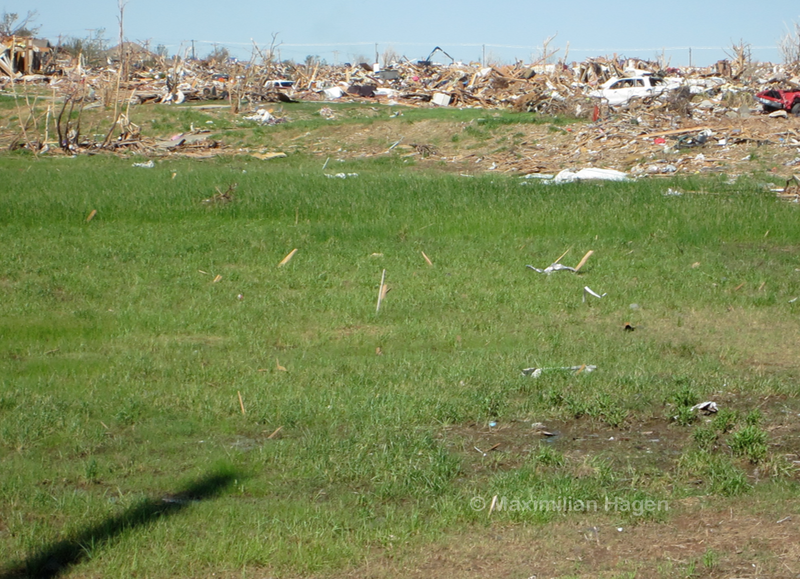 The visible EF0 damage contour was just about 2.5 miles wide on the ground. This came up in the discussion on Wikipedia as well. One user suggested that the radar may have picked up the mesocyclone rather than just the tornado. I’d like to see the paper this report was based on though, especially where they got the 335.5 mph wind speed. Amazing damage shots. Looks like EF5 damage to me in multiple places. I’m surprised the update did not categorize the damage west of Briarwood as EF5 – in your pics I see complete debarking, ground scarring and obliterated vehicles. 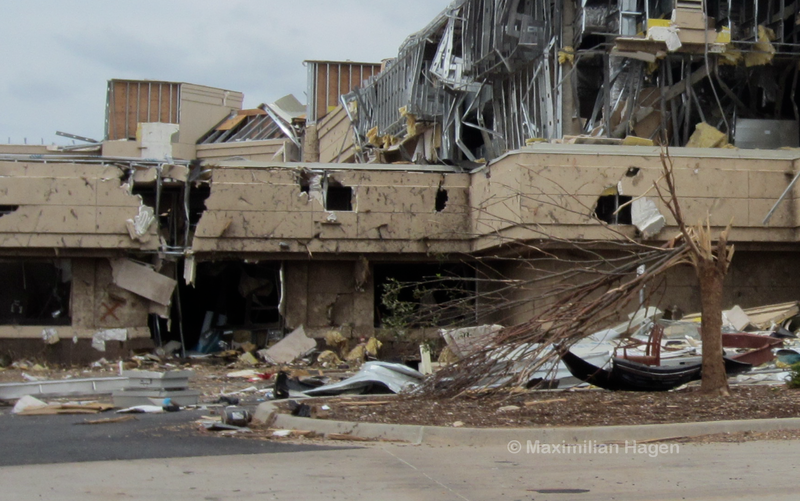 Max, are you going to do a personal survey in Vilonia, AR? Photos coming in this morning show potential EF5 damage. I will not be, seeing as I live in Hawaii. Beyond my storm chasing trips to the mainland, I am largely cut off from doing what I love. At the end of this year, I’m moving to tornado alley so I can survey all the tornadoes I want. And I agree, the Vilonia tornado was a monster. Looks like textbook EF5 damage, particularly to one of the home’s that appears to show solid anchoring. But I’ll reserve judgment until the survey is underway. Is that wind rowing I see in the second picture? I am damn near 100% certain the Vilonia tornado is going to receive an EF5 rating. 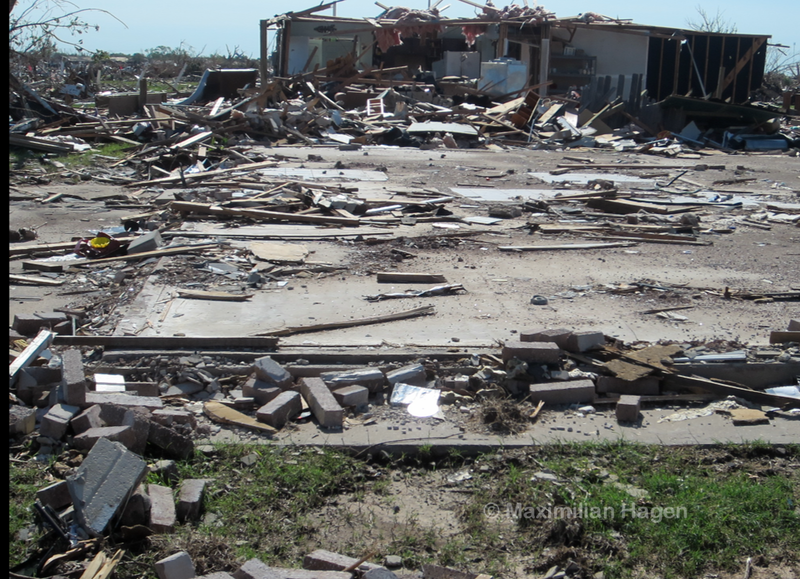 The damage is some of the most intense I have ever seen – clean slabs, extreme wind rowing, ground scouring. 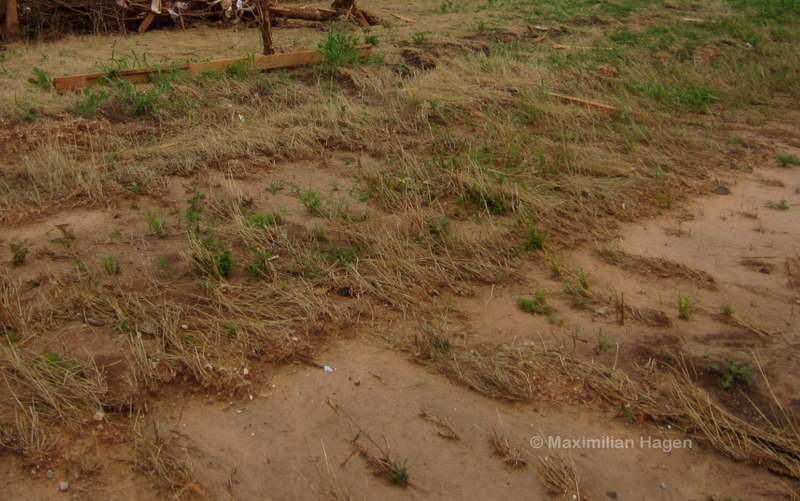 Unless there were no well-built homes in its path, this tornado has EF5 written all over it. Yeah the Vilonia tornado warrants at least an EF4 and looking at some of the photos an EF5 seems probable. Max, how about the Louisville, Mississippi tornado. It has been preliminarily rated EF4. I would say at minimum high-end EF4. The damage photos of homes swept away seem to be a possible candidate for an EF5 rating. 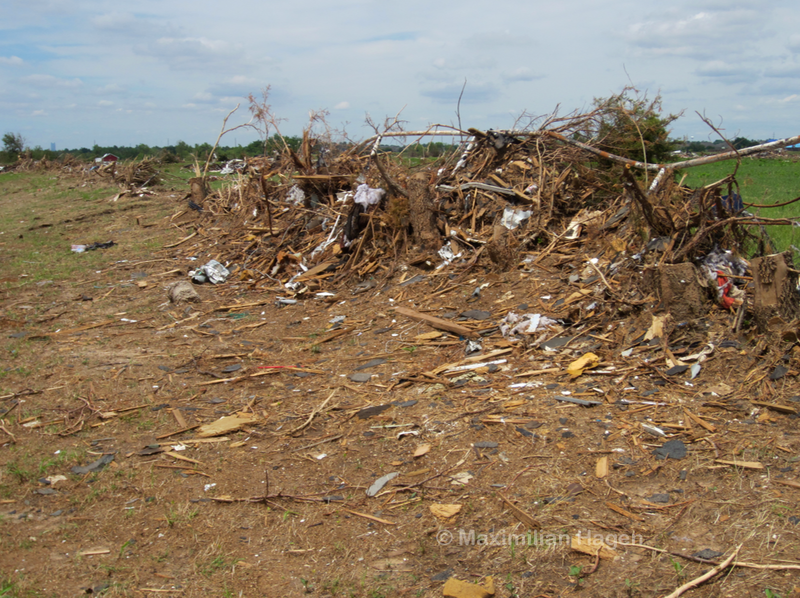 The Louisville, MS tornado swept homes clean off their concrete slab, completely debarked trees, and extreme ground scouring. Here are some damage photos. http://www.srh.noaa.gov/jan/?n=2014_4_27_28_29 . The guy who did this survey is really conservative when rating tornadoes. The link doesn’t work. I’m in the midst of final exams, so I haven’t had time to look up any pics of the damage from the Louisville tornado, but you’ve piqued my interest. I do believe, however, that the delay in rating the Vilonia tornado is due to the fact that it is going to receive an EF5 rating. Sorry just go under NWS Jackson, MS and click on the Louisville MS tornado. Just reviewed it. I agree, the damage is definitely intense – the type of thing that might have received an F5 rating in the 80s and 90s (probably similar to the 1998 Birmingham tornado). The photos are pretty low quality, however, and no aerial damage shots are included to give better context. I also don’t see too much ground scouring. I accept the EF4 rating for the Louisville event, but I would be shocked if the Vilonia tornado did not receive an EF5 rating. One thing that I have been thinking about. If the Vilonia tornado is rated EF5, it would only be the second known F5/EF5 in Arkansas history and the first on official record. Is it likely that the surveyors would step it down to EF4 because of a perceived lack of precedent? 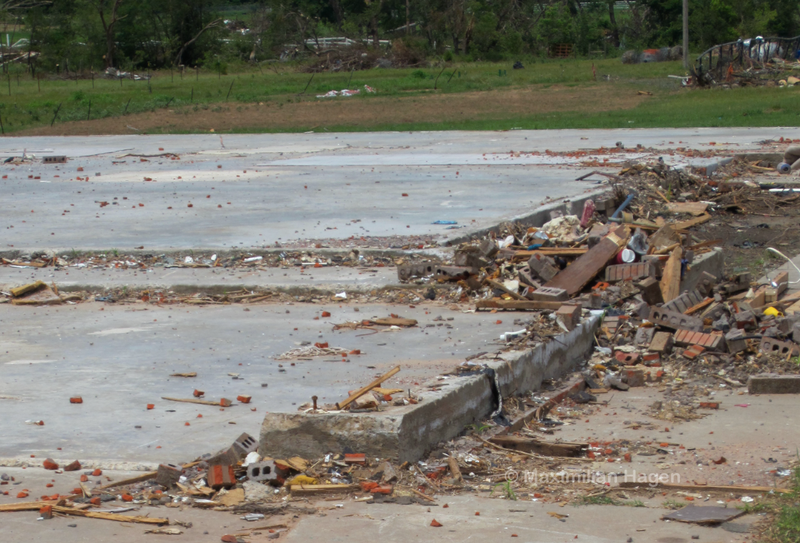 But, alas, the Vilonia tornado was given a high-end EF4 rating. Almost every single high-end EF4 of the past 4 years, in my belief, would have been an F5 pre-1990. The surveyors rarely take into account unconventional damage indicators – ground scouring, vegetation damage and the movement of large objects. Yet sometimes, like with the ’11 Philadelphia tornado, it’s the basis of the EF5 rating. It’s very inconsistent. 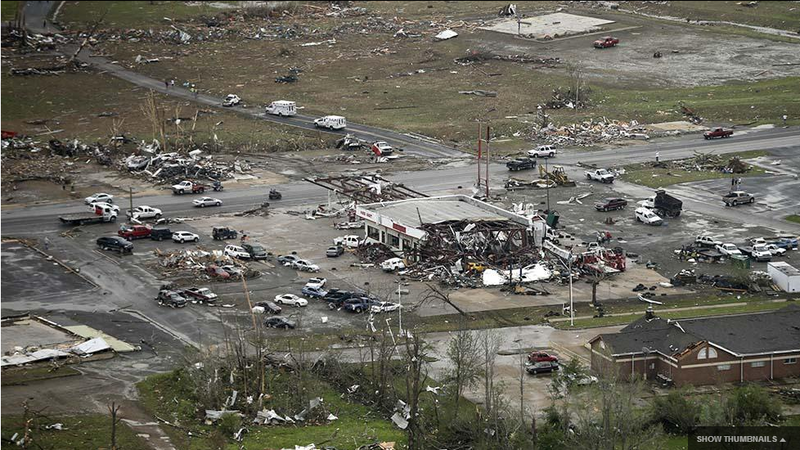 The Vilonia tornado was very, very violent and capable of causing EF5 damage. That is my belief. I may even add it to the “Strongest Tornadoes” list – I’m definitely more impressive with Vilonia than I am with Xenia and Barneveld. Do you believe that this rating may be disputed? I find the EF-4 rating uncharacteristic of the damage that occurred. If you were to add it to your strongest list, where would it place? The Rainsville tornado was upgraded to an EF5 many weeks later after a secondary damage survey, so it’s possible the Vilonia tornado could get a top rating. I will reserve my complete judgement of the tornado until after I have seen more images and the survey details, but right now I’m thinking the tornado was comparable to the 2013 Moore tornado, which I ranked #14. My list will eventually need to be edited – I no longer feel Barneveld or Xenia deserve a place in the top 20. It’s just a silly list, but I try take it seriously. What utter bull? Vilonia also gets an EF4 rating. I can’t stand conservative surveyors. We have to worry about every freaking bolt and wall. I am not happy about it. So, at this point it appears to have been rated a high EF4. I find that rather surprising. What are your thoughts? It seems if though high-end EF4’s are even more impressive than EF5’s. I tend to wonder if a DOW would have helped in upgrading this tornado to an EF5 had it of been readily available. I would not be surprised if the Vilonia tornado had winds in excess of 250 mph. I wouldn’t be so sure since the NWS rejected the radar-based ratings on the El Reno, OK and Bennington, KS in 2013. Yeah Nick, I know what you mean but those tornadoes didn’t do anywhere near EF5 damage. This tornado in Vilonia was at the very least on the borderline of EF4/EF5 when it came to the damage it did. I’m sorry if you already said something about this but I was wondering what you thought about the 1896 Seneca tornado? From research it seems like one of the worst in the 19th century. 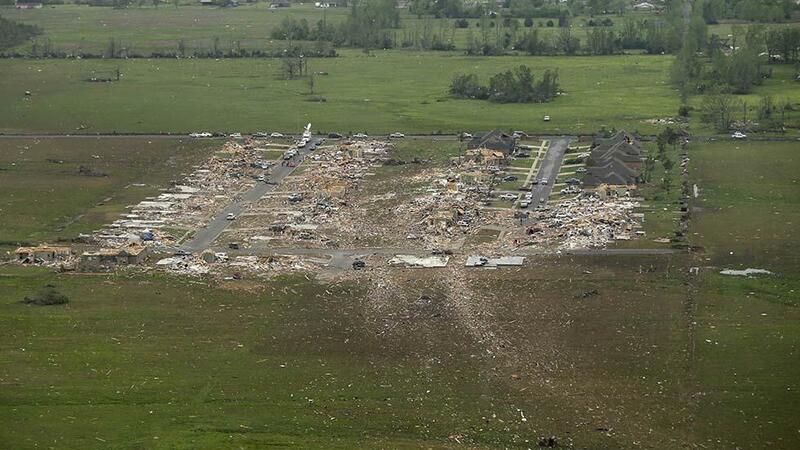 I haven’t seen a damage picture from the Seneca tornado that showed extreme damage. In fact, I’ve only seen one or two damage shots in total. I would be very willing to add it if I saw a good damage shot – the descriptions sure make it appear intense. That message to that Cody on americanwx.com from that John Lewis from NWS in Little Rock is nothing but a lame excuse to not rate the Vilonia tornado an EF5. That comes down to nothing but extreme nit picking. I wish someone else had other people had authority to rate these tornadoes besides NWS offices. I would like to hear what the massage said. All I have heard is that it ultimately came down to poor anchoring on the houses that were swept away. I’d like to ask, would the Jarrell F5, ultimately earned an EF5 by the EF scales very strict rating manner?